We love Acure Organics around these parts. Not only are they one of the most widely available, effective and affordable natural skincare and haircare brands we’ve encountered, but they’re changing the personal care industry…and the minds of consumers…in a BIG way! 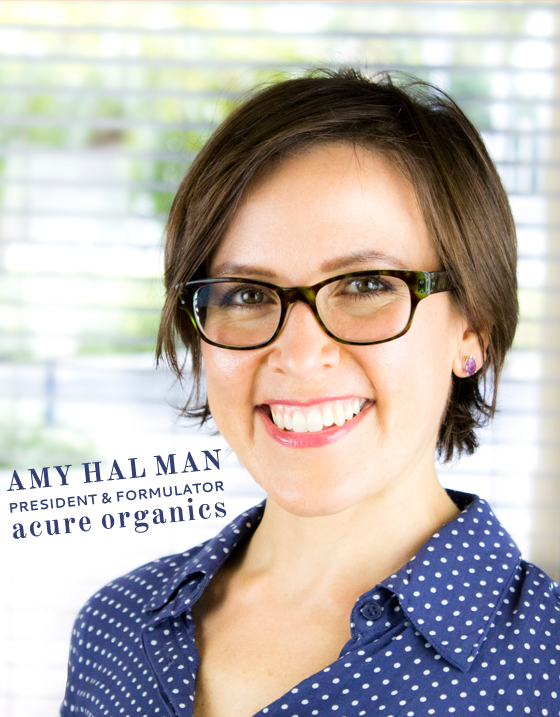 So, we were pretty thrilled to interview Amy Halman, the President and Formulator of Acure. Amy is extremely knowledgable about the natural products realm and is the leader behind Acure’s hugely successful brand that is sold everywhere from natural beauty boutiques to your local Whole Foods. In her interview, you will discover: Amy’s favorite Acure product, upcoming product releases from Acure (!) and the answer to the universe. OK, maybe not the latter, but everything else. 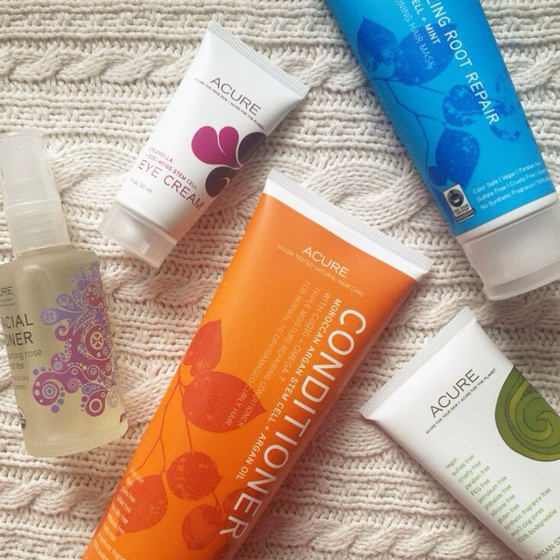 AND: in our upcoming posts, we’ll be sharing our favorite Acure Organics products. (Because we haven’t done enough of that already…ahem…) Onward! Can you walk us through or tell us a bit about your ingredient sourcing process? How do you go about finding sustainable suppliers? We passionately believe in organic agriculture so we seek as many certified organic ingredients as possible, not only for the sake of what you are putting onto and in your system but also to protect the planet from the synthetic and toxic ingredients that wash down the drain and into our air, waterways and soil to remain for generations to come. It is also crucial to make sure your resources are cruelty-free and no animal testing is conducted at any point in the process. We look for high-quality ingredients within the U.S. whenever possible to support our local economy and to be very mindful and connected to our carbon footprint. However, when sourcing from around the globe we hunt for fair trade resources to support fair wages and healthy working conditions for workers and their families. We never look for ingredients as the “next new trend.” It’s so much more about clinically proven efficacy that is actually natural, healthy, supportive and proactive to the skin and body at the same time. Cutting edge plant and food-based technology. The Acure Organics line has several “cornerstone” ingredients used in a number of your products – like chlorella growth factor (CGF) and the curoxidant blend. How do you know when you’ve hit on a staple ingredient that you’ll use across the line? Bottom line is simple, effective nutrition for the skin. When we hit an ingredient that makes proven impact across all skin types for balance, regeneration and optimal function, it makes an ideal staple ingredient for our formulas. When using cutting edge natural technology, you must pay attention to the fact the most ingredients are very skin-type or condition-specific and use them accordingly (i.e. lilac stem cells for in the Oil Control Facial Moisturizer, Gotu Kola stem cells in the Day Cream, etc.). However, when you find ingredients like CGF, powerful antioxidants, CoQ10, essential fatty acids found in argan oil, probiotics, etc…these optimize and balance general skin function as an organ, just as if you took them internally. So it makes them like supplements or multivitamin support for the skin, when applied daily, for all skin types. We know a lot of women who are reluctant to give up their traditional age-fighting products – even though they contain harsh ingredients. How do Acure’s anti-aging ingredients stack up to those in traditional products? We feel it is ultimately most important to look at the whole picture so we stay committed to creation of formulas that are as healthy and natural as possible without sacrificing efficacy, and at the same time, staying economical so that everyone can have access to healthy, effective personal care, not just someone who can afford an $80 moisturizer. Our mantra is that it’s not enough to be natural, it also has to work. So we spend a lot of time formulating with nutritional supplementation to drive product performance. Treating your skin as your largest organ of the body and first line of defense, you have to be sure to feed it the same type of nutrition you would any other vital organ. We incorporate things that you would find on the supplement shelf for clinically proven efficacy…ingredients like CGF (commonly found in super green formulas), CoQ10, Probiotics, EFA’s, etc. These things work to get at what’s breaking down in the skin in the first place versus the synthetic and possibly toxic cosmetic ingredients that simply try to cover what’s already been done but overtime, just make the health of your skin worse. What’s your all-time favorite product from the Acure Organics line – the one you couldn’t live without? Why? There are so many! First and foremost, I love the Oil Control Facial Moisturizer. Not only does it give you your basic daily dose of immune support, anti-aging and recovery through the skin-immune technology and 1 % CGF but it also protects from bacteria growth and break down of your natural hydration levels with Lilac Stem Cells. Excess oil secretion is typically from underlying dehydration, so protecting and boosting your natural hydration without a weighty, thick application is the best of both worlds! Great for those who battle breakouts too because the same stem cell is clinically proven to reduce acne lesions by 58% in a 30-day trial. It is the ideal tool for problematic skin without the drying irritation from most blemish products. What does the future hold for Acure Organics? Can you give us any hints or share with us any new products or initiatives you’ll be launching soon? We have just ventured into a taste of color application with our 5 new NSF certified organic Lip Lushes. They contain Echinacea and edelweiss plant stem cells to fight fine lines and wrinkles while supporting healthy immune response in the lip tissue. Argan oil based and delicious sheer colors! We are also launching our new USDA certified organic argan oil castile soap, in Peppermint, Tropical Citrus and Fragrance Free. Using saponified argan oil, they have a million and one uses that you would expect from a castile without all the drying effect on the skin. We have also launched our new Show Your Face Project initiative. As a personal care/skin care manufacturer, we are sick of having the same old “beauty” conversation. We believe that when individuals are engaged in and sharing their passions and talking about the things that light them up inside, that’s when they are truly magnetic. So we created our own initiative to ignite and support that process at an earlier stage. SYFP is a series of contest platforms aimed at youth and young adults, some as simple as sharing your thoughts and opinions through social media, all the way up to proposing your passion project and receiving a $10,000 grant from us to go make it happen! LOVE, LOVE, LOVE…. Of course you know I consider myself an Acure woman so I’m a big fan of Amy and the brand. I’d love to go to the Acure headquarters one day. Consider that a bucket list item. Thank you, Paula! I KNOW. We were literally BESIDE ourselves about the chance to interview Amy. And you just let me know when you’re ready to rent out an old school bus and travel the countryside visiting Acure, Badger, Osmia and all of our other fave natural brands. #greenbblogger field trip. Like a family band. Great interview! I’m such a huge fan of this brand and enjoyed learning more about Amy. Great interview! I currently have Acure’s cell stimulating mask, shampoo and a hydrating toner which I’ve yet to break open. Looking forward to trying out more products from them! OOOOH! I hope you’ll come back and comment about how all of those are working for you…we’re posting some product reviews next week! Would love your take. I wrote up the cell stimulating mask a while back, that’s definitely a favorite for me! Fantastic interview:) I’m a huge Acure fan too…all this talk of new releases has my heart going pitter-patter. Now they just need to make it to Canada! We’re gonna need a bigger bus. Completely serious about this field trip, people. And…I know! I can’t wait to try out their new lip products. It’s always such a treat when I can buy natural products LOCALLY as opposed to online, hopefully Whole Foods will carry the new stuff! Love this! I can’t wait to try more Acure products in the future! Thank you! It’s definitely one of those brands that you “just can’t get enough” of – I’d like to work my way through their entire haircare line. Love this! I absolutely love Acure, tried their shampoo & conditioner and I also have their cleanser & toner which is my favourite out of all that I’ve tried! When I visit America I’ll definitely pick up some more from them! Thank you! Big fan of the toner, as well – in fact, I need to restock! Loved this! I’m a fan of Acure products too and I really think it’s a great overall brand. It was so interesting to read more about Amy and I loved hearing about Acure’s ingredient sourcing process and new initiatives to promote healthier consumer decisions. Great job, ladies! Great interview girls, really interesting to hear the reasoning behind including certain ingredients. Can’t wait to eventually try Acure one day – sick of hearing everyone rave about it, I wanna join the party! Thanks, Ana! Dang. I should have asked Amy about overseas shipping…! Lovely interview, I’m hearing so much about this brand, I need to do a swap with someone across the pond because it’s hard to get hold of in the UK (not impossible but can be expensive). Lovely interview! I am a bit fan of Acure….How did I miss your post ?